Well it was finally released – Sept. 1 – and I got into it asap – (had to finish The Cartel by Don Winslow first). June Reid’s family is killed in a house fire which only she survives – she was sitting outside. Her boyfriend Luke, a mixed-race man 20 years her junior with a jail record (although he could have been innocent), and her 20-year old daughter Lolly, who was to be married the next day, were inside along with June’s ex-husband/Lolly’s father, Adam. The house was old and shambley as is the very small tourist town of Wells, Connecticut – a where June had come annually for years and now lived – where Lydia Morey, Luke’s mother, had lived all her life. But the story is also set in the upper Pacific Northwest, in Moclips, Washington, another very small tourist town, this one by the ocean. The main plot thread concerns what happens to the survivors – to June and Lydia who wasn’t at the scene but was seriously affected. There are other important characters with their own horrendous loss issues and they tell their stories, sometimes in 1st person sometimes not adding a wonderful texture to the narrative. Mainly this is the story of a tragedy and it’s aftermath – the themes are pretty explicit as the characters are revealed with and without families, supportive human connections. The issues which bind them are very difficult personal losses, grief, loneliness, regrets, and memories. June and Lydia aren’t the only ones to have experienced those things. 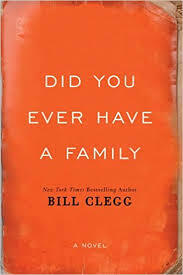 Clegg is an excellent stylist using clear, insightful language and the chapter/narrator transitions are smooth and make sense. The reader doesn’t know what or who started the fire but there is a clue in the first chapter so underlying all the grief is a thread of suspicion – how did the fire start, who and why? I wouldn’t call it a novel of suspense though. Just a beautiful story wonderfully well told. I’m betting this book will make the shortlist of the Booker Prize – probably not the winner though. LOL You know I’m relying on you to know whether I should chase up any of these books, I recognised very few of the longlisted authors and have only one on my TBR, The Fisherman. I’m going to post my official guesses as to what I think the Short List should look like asap – LOL! I think I’m really US biased this year, but 5 of the 13 are from here. #Correction: Two. I also have The Chimes by New Zealand author Anna Small. I’d better get round to reading that one fast! There is zero word (nothing, nada!) about when of IF The Chimes will ever be here.